Tom Venner received an MFA (Ceramics, 1978) from Eastern Michigan University and a bachelor’s degree (1973) in Fine Arts from Alma College. Over the years, his work as a ceramic artist has ranged from large, environmental sculpture to pottery. His artwork is held in numerous private and public collections and has been featured in publications such as the New Art Examiner and Ceramics Monthly. Over the years, he has served as the president of the Ann Arbor Street Art Fair, president of the Michigan Potters’ Association, and on the board of directors of several area arts non-profits. He has been chair of the Visual and Performing Arts Division at Siena Heights University, head of the Eastern Michigan University Art Department, and dean of the College of Arts and Sciences at EMU. 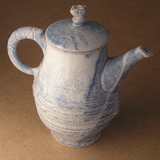 He currently is professor of ceramics at Eastern and maintains a private ceramics studio. I have always been interested in the intersection between the untamed, natural properties of clay, and the creative and practical efforts necessary to shape it into sculpture or pottery. In finding this balance, the human hand plays an important role. Ideally, good craftsmanship, beautiful glazes, textures, and effortless function, combine in a way that will touch the head and heart.